The MS [Multiple Sclerosis] Readathon has been running so long now – 28 years – that the organisers are seeking people who did the Readathon as kids to try its Readathon Book Swap in their workplace. “Staff are asked to bring in a book they really like – so it’s not getting rid of your worst book – and to wrap it in plain paper and write three cryptic clues on the wrapping. Everyone does the same, and everyone makes a donation, and you get to pick up another book based on what you read in the cryptic clues,” says Ava Battles, chief executive of MS Ireland. However, the main targets of the campaign are still children. Children who sign up ask friends and family for sponsorship for each book they read for a month, beginning October 9th. The idea is that children are encouraged to read, while the funds raised go towards the various support services provided to people with MS, by MS Ireland. Gillian Smith, who teaches sixth-class students at St Fintan’s National School in Sutton, Co Dublin, has been doing the Readathon with her students for the four years she’s been teaching there. She says the benefits of encouraging reading for pleasure can’t be overstated. “It does wonders for their literacy skills, their oral language and their writing skills as well, and even for their memory. They have to remember all the different characters, and figuring out what’s going to happen next in the book is great for their critical thinking skills. It’s so important,” she says. 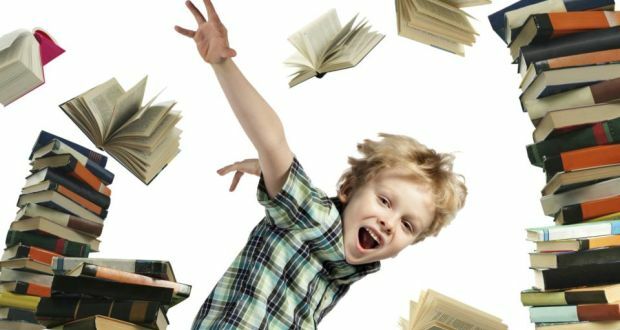 Beyond simply the academic benefits, children’s author Sarah Webb believes there are other benefits to encouraging children to read and, in particular, to read what they want. “The important thing for me is to try not to be judgmental about what they read. A lot of children now are reading Manga or sports biographies or the Beano. I like children to really enjoy the reading experience and even if they’re nine or 10, maybe they still want to read picture books. It’s important they have access to the kinds of books that they want to read. Reading is such a lovely, calming way for them to relax and unwind after a very busy day. Reading relaxes children in a way that screen time does not necessarily,” she says. The Readathon is a win for students, teachers, parents and MS Ireland, according to Battles, who emphasises that the campaign also aims to spread awareness of MS. Every year, Smith says, it’s a priority for her to bring some level of education about MS to her classroom. “I go on the Readathon website with the children and watch the videos about people who have MS. Last year there was a girl whose mum had MS, and she explained what it’s like to have a parent with MS. It’s important for the children to be aware that there are people who are less fortunate than them and it does develop their empathy towards others,” she says. Last year, more than 15,000 children took part in the Readathon, most coming from 450 participating schools across the country. Battles says teachers are usually very enthusiastic about the month despite some challenging financial years recently. “A lot of the schools are looking at their own fundraising initiatives and schools can be reluctant to ask parents to fundraise again because they may already have been fundraising for the school. “It has been challenging over the past few years but I have to say any of the teachers who do get involved are incredibly enthusiastic about it because it’s a great reason to encourage young people to read . . . We’re really trying to encourage more young readers to come on board so we’d certainly like if we got more readers this year,” says Battles.